Teachers in Arizona and Colorado were seeing red this week, and they have a right to be mad. Average teacher salaries in both states have declined significantly, in real terms, over the past two decades. But teachers should also be angry at how their state pension plans are eating into their take-home pay. Let’s start with Arizona. I pulled data from the Boston College Center for Retirement Research Public Plans Database to see how contributions into the Arizona State Retirement System have changed over time. The graph below shows the results. The blue line represents the amount employers are paying in for benefits (in actuarial terms, this is called the normal cost). The orange line shows the actuarially required contribution rate to pay down the state’s unfunded liabilities, which essentially acts as a form of debt. And the gray line shows teacher contributions into the plan, as a function of their salary. A few clear trends emerge. For one, the total required contribution into the Arizona plan has more than doubled over the past 15 years. That’s money that can’t go toward teachers or textbooks or anything else. Two, Arizona teachers have seen their own contributions more than double. Those mandatory contributions come directly out of their paycheck, and they further reduce each teacher’s take-home pay. 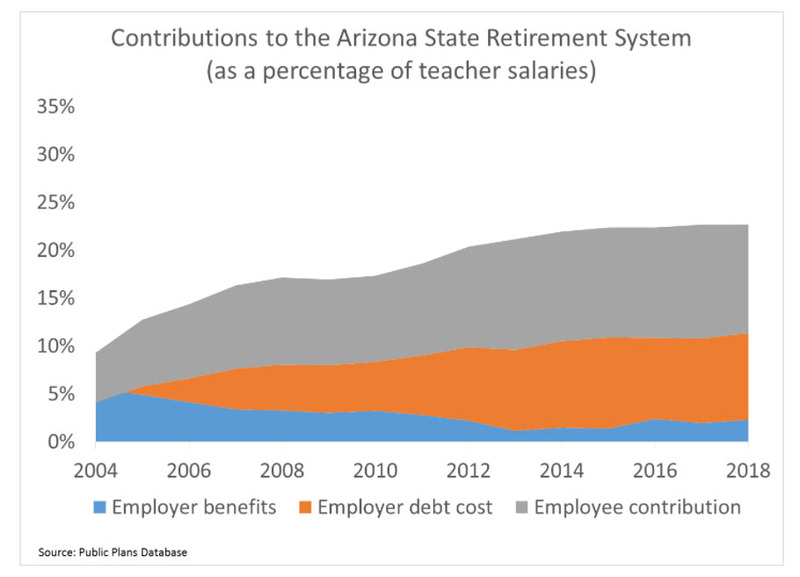 Three, look carefully at the blue line, the amount that Arizona employers are contributing toward actual teacher retirement benefits. As the graph shows, Arizona schools are barely offering retirement benefits at all. That is, the state is operating a retirement plan on behalf of its teachers, but employers are barely contributing to the benefits earned under that plan. Thankfully, Arizona teachers are enrolled in Social Security, so they at least have something else to fall back on. But that’s not true for Colorado, where teachers are not covered by Social Security. In fact, Colorado teachers are even worse off. The state cut benefits for new teachers in 2010, and it’s on the verge of doing so again. As a result, the amount of money that employers are directing toward teacher retirement benefits is falling in Colorado (the blue line in the graph below). Today, employers pay just 4 percent of each teacher’s salary toward retirement benefits. That’s comparable to a private-sector company offering a 4 percent match into a 401(k) plan, but in the private sector, all employers are required to contribute to Social Security. As in Arizona, Colorado is facing a mountain-size pension debt. But unlike its scenic Rockies, Colorado’s pension debts are growing and causing the state and its school districts to cut back on other things. None of this even touches on the distributional aspects of these pension plans. Both states suffer from steep teacher turnover rates. In Arizona, only 14 percent of teachers will qualify for a pension worth at least their own contributions plus interest. When we studied Colorado’s plan, we found that only 15 percent of teachers will stay long enough to qualify for adequate retirement benefits. Not by coincidence, Colorado is in the midst of another round of cuts to its pension plan, and everyone is on board, even the state teachers union. In fact, the main fights are over how deep those cuts should be, and whether Colorado will continue forcing all its teachers into this expensive and fundamentally unfair defined benefit pension plan, or whether it will give them the option of a portable defined contribution plan. To be clear, Arizona and Colorado are merely examples. Policymakers all across the country have been pouring more money into teacher pension plans while they simultaneously cut benefits for new workers. These trends are likely to continue unless state legislators start responding to pension cost pressures with long-term solutions. But until that happens, teachers are likely to see more and more of their take-home pay eaten up by rising pension costs. That doesn’t make for a catchy slogan for rallies at the capitol, but teachers should be mad about that, too. 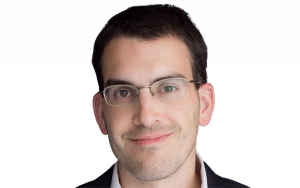 Disclosure: Bellwether Education Partners was co-founded by Andy Rotherham, who sits on The 74’s board of directors and serves as one of the site’s senior editors.